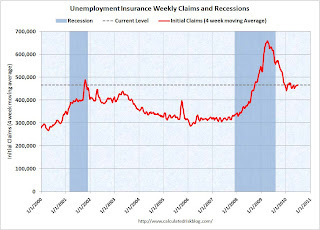 The advance number for seasonally adjusted insured unemployment during the week ending June 19 was 4,616,000, an increase of 43,000 from the preceding week's revised level of 4,573,000. The four-week average of weekly unemployment claims increased this week by 3,250 to 466,500. The dashed line on the graph is the current 4-week average. Initial weekly claims have been at about the same level since December 2009. Historically the current level of 472,000, and 4-week average of 466,500, would suggest ongoing weakness in the labor market.